The actual colorway is somewhere between the too shiny, too blue-ish photo above and this too yellow one. That’s the first repeat of the lace pattern, and I look forward to making some serious progress on the shrug later today. It’s a pleasant little pattern, with a 20-row repeat, but the lace pattern is only worked on the odd rows, and three rows within that pattern repeat. I couldn’t be happier with the marriage of the yarn and the pattern, and hope to be wearing my first lace, first shrug, later this week. SWS felts in a HURRY. 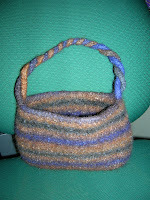 I timed it, and in a bit over three minutes, the bag was felted, tightly so. Not a stitch defined, anywhere. My hot water is pretty hot, but I can still fish the pillow case out bare-handed, so I think it’s the yarn, I really do. I’m almost tempted to felt it on the delicate cycle next time, just because this way requires constant vigilance! This is the Sophie pattern, basically. I’m calling it the Not-So Sophie, because I like a shallow, barely bigger than my wallet bag that fits snugly under my arm, on my shoulder. I dropped about 12 rounds, so I decreased at 10, 20, 30, 35 and 40 rounds, and bound off after round 42. It took right at two balls of SWS, or 2oo+ yards. The colorway is Natural Navy, done on #10.5 circs, with the same sized dpns for the i-cord. I felt in a polyester, king-size pillow case, tied shut, with four of Mugsy’s tennis balls thrown in to beat it up a bit. I add about two tablespoons of soap powder and wash on hot/cold. Then, with the Knight’s help, I stretch and pull it into the shape of choice. Anything in the house can serve as the “form” during the drying phase. If it fits into the bag and looks approximately like what I want in the end, it’s called into action. I also took this shot for you. SWS is a great yarn for felting, but because of this very trait, I can’t imagine using it for non-felted items. 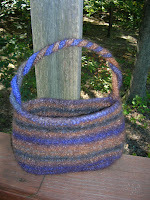 A pal made me a sock bag in SWS – unfelted – and I think I might line it for future use. The early fall edition of Creative Knitting has a cardigan/jacket done in SWS on the cover. No way. It would pill and shed too badly for practical wear, I’m certain! I didn’t do anything but hold that bag in my lap while knitting away on it, and you can see how fuzzy the bottom is, and how that one “blonde” strand pulled itself loose. Of course, thanks to the nature of felting, the finished product reveals none of these little secrets, and is rock solid, tough and ready for my daily use. I don’t get the names Patons uses for SWS colorways. There’s no navy in this wad of color. Purple (gasp! it’s true! ), lots of tan and taupe that thankfully turned a solid, warm brown, a touch of grey, and the black in the unfelted version just felted into a dark grey. Still, even with the purple, I’m very pleased with the results. It’s a bit deeper than my summer Sidekick, and it won’t show dirt. Perfect. My good pal fortune continues. In Sock it to Me, a very light-hearted “Tink” had been emailing regularly. She sent me the mother lode of teaser packages early in the swap, proving that she’d read my questionnaire and then some, and really making me curious. From that package, I knew we shared a Loopy passion, and yet again, I tried to guess my pal’s identity. I was dead wrong, of course, and do hereby renounce future hunches! Thanks Ana, although I do feel guilty that it seems knitting socks for me led you to call your blog the Frog Pond. So, feast your eyes on my Uptown Boot Socks in Cherry Tree Hill, in Cherry. They fit like a dream, and feel like a cloud. I love red, but I’ll be on the lookout for more red tops now, so I have every excuse to wear these socks very regularly. (Yes folks, my feet are that short. Lucky Ana, huh?) Oh, and don’t tell the Knight, but I’ll need another pair of clogs too, because my favorites are brown and a multi-colored felt, and these want a navy and/or black pair. Even though she’d already sent goodies above and beyond expectations, the awesome Ana sent more. How ’bout that Scout’s Swag yarn in “secret colorway”?! I love it! The Godiva is resting up for its big moment, after dinner. I’ll have to put both dogs outside, because they can’t have chocolate – like I’d share. (I mean, I guess I could, but you’re not here, so it’s all theory and conjecture anyway.) The cute yellow thingee is the result of an especially strange question Ana asked a couple of weeks ago. Out of the blue, she emails me and lists a very odd assortment of animals and asks which would be my favorite. (No, dogs weren’t on the list, nor were horses. Go figure.) It’s “Kooly the Koala” a kritter craft case. He’s already holding the notions I use the most – my chibi, measure tape, scissors, etc. Isn’t he cute?! Thank you, Ana. And thanks AJ, for hosting a fun sock swap. It’s always a little bittersweet when a swap winds down, but I still have three in the works, so I should get back to knitting. Tomorrow? Knitting and shopping. I hope to mail my Vegan Pal 2 swap out next week, and then, you still won’t get to see the pictures of the secret project! Well, we blew past 200 posts the other day. This is post #202. How ’bout that?! Those of you who know me personally know I can talk a blue streak if I’m in the right mood, and evidently, I have been most of the time since oh, say… March. Thanks for reading, caring, and in a lot of cases, becoming my friends. My scanner is so old I can’t hook it up to this computer without adapters, so yet again, ‘scuse the photo quality. 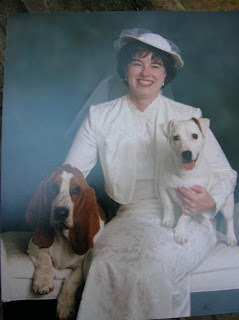 A little over ten years ago, the dogs and I all dolled up and went to visit a photographer friend, and bridal portraits were made. This is a squinty-eyed proof of my favorite pose, and my offering for Dogs on Thursday. They’re still handsome old men, but boy, were they beautiful babies. I’ll have to get my techie brother inlaw to scan all of the proofs in for me, and if/when I do, I’ll post a better version, because it is my all-time favorite photo. There’s another great one of the whole “family” which was taken with the engagement photos, but it includes my stepson, so… sorry. It will remain on the wall for in-home guests only. I’m in a bind here, folks. I’m knitting, I promise, but it’s for Anne and as she is the sole hostess for the Felted Bag swap, she knows I’m her pal. So, pattern and yarn selections are the only secrets I can have. That means not even a shot for you. I toyed with the idea of a sepia shot, but that wouldn’t tell you much and would tell her too much. I feel like a mean department chief, writing rules and regs to punish everyone just because one idiot firefighter can’t behave, but those are the breaks. I can tell you it’s an awesome pattern and I know she’ll love it and the colors I selected. I tried to figure out how to post it on Ravelry without giving away too much, but trust me, she’s know, even if I just put it on my queue. As of this weekend, the season has officially changed on the calendar – but what makes Autumn feel like Autumn to you, and why? Now, for the conventional answer. Everything. I love the whole autumnal package. While I relish the four distinct seasons here in Central Virginia, and you’ll find me calling each my favorite as it arrives, autumn is the real, true favorite. I love a crisp, cool morning. I love watching the leaves change. There’s nothing like wrapping up in my favorite old corduroy shirt of my Dad’s on a Sunday afternoon. Apples. All things pumpkin. You get the point. Hands down, this year, the upcoming tenth anniversary with the Knight is the biggest part of autumn. Both of us had brief first marriages, and I know that there were plenty of folks whispering that we wouldn’t last. Picture me smug, and happy. To celebrate, I’m finally ordering wedding photos. Maybe I’ll scan one or two for you. I especially love my highly controversial bridal portrait proofs. I had two done; one of just me, for my stepmom and my mother inlaw, both of whom scoffed at my primary poses, which were with my boys – Fred and Mugsy – and then my father inlaw and I have that one, with me and the dogs. With a nod to my Knitter’s Knight for the photo, here are the Monkeys. Done. They are a titch big on me, s o I hope that means they’ll fit with the negative ease my Sock it to Me pal says she likes. I don’t mind pooling, so I hope she doesn’t either. Sorry for the blindingly white legs, but that’s what I have. They brighten up the photo anyway. So, the socks and their pals will hit the road tomorrow, along with my tea pal’s package, and my portion Jessi’s prizes for winning the bingo game. Congrats again girl! Now, if you’ll excuse me, it’s past my bedtime. I also feel obliged to note that everyone in the free world loves The Needle Lady, except me. Even Anne loved it. I did note they’re polite enough and they have a selection of primo fibers. Maybe I’m just too picky. Dunno. I think it’s because I am a part of the fourth generation of a family business that I have exacting ideas about how my patronage should be valued. 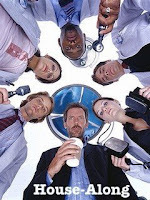 I might get over myself (the Knight says his best friend is House and I am what would happen if House and Cuddy [my fav!] had a child) if places like The Loopy Ewe and Carodan didn’t lead me to believe that my expectations are very realistic. Also, swing by and visit Blume’s Accessories. Like all of the Etsy folk I know, Mary will also treat you right. She’s just getting started, so check in often. I think the Monkeys will be a completed pair tonight too. Then I can ship that and my tea pal’s package out tomorrow!